Lucy Plummer from London is one among many travellers who are part of Clap Global’s Travellers In Classrooms initiative. She is a writer and is currently residing in Mumbai. Lucy has given five Clap Talks so far and has recently joined the Clap Global team. “What motivate me are the messages that students write at the end of each Clap Talk. It makes me happy when they share that they have seen their country in a new way. I feel I am contributing to raising a generation that is a lot more accepting of differences and who feel that they are part of a global community.” She has learnt something new from each of her Clap Talks. During one of her talks she had an eye-opening insight toward gender roles in India when a six-year-old boy shared that his mother had not let him change his baby brother’s diaper stating that this was not a boy’s job. She realized how deep-rooted gender issues are in India. Like Lucy, many travellers from across the world take part in Clap Talks, a cultural exchange experience that enables the geographically overlapping world of travellers and children to enrich each others’ lives. Travellers in a city can have eye-opening conversations with classrooms in that city and children get to learn about the world through firsthand interactions with real people. 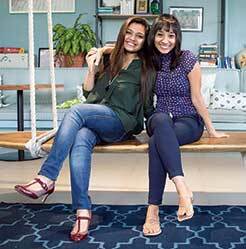 This pioneering initiative was started by two childhood friends – Aarti Chabbria and Shirin Johari. While Aarti is a social entrepreneur and an educationist, Shirin is well-known in the advertising industry. Within a span of three years, both have worked hard, putting together a Clap Curriculum and a passionate team to work toward their vision of building a whole new generation that is more compassionate towards personal, social and cultural differences. They aim to achieve this through their idea of ‘Travellers in Classrooms’ as a compelling teaching tool and as a testament to the power of dialogue in bridging two worlds. Today they have reached out to more than 22,000 students from 104 schools and have brought in travellers from 88 different countries. Clap Global now operates in seven cities across India – Mumbai, Pune, Chennai, Bangalore, Hyderabad, Ratnagiri and Mohali. International Clap Talks have also taken place in Chile and Tonga. Schools that sign up for Clap Talks receive a Clap Kit containing conversation aids, flashcards, the Clap Passport, postcards, wish cards and creatively designed question balls. The Clap Passport is a diary that gives a Clap student the space to reflect on their Clap experiences. This helps them transform their own insights into their unique world view and philosophy for life. The Clap Curriculum focuses on enhancing Clap’s six core values – curiosity, independent inquiry, emotional quotient, self-awareness, self-evaluation, imagination and connecting the dots. The Clap Curriculum is based on the belief that people will grow more open-minded, adaptive and accepting; they will develop a higher cultural and emotional quotient, learn to challenge their biases and will act, create and evaluate themselves in the context of a much bigger, broader world. These traveller stories are real stories about their childhood, family, home, friends, their tough times and happy moments. This enhances the cultural intelligence of the children, making them more aware, accepting and open-minded of cultures across the globe. These firsthand stories have a more lasting impact on children than a chapter in a textbook. They touch upon a wide range of topics such as geography, interpersonal relationships, gender, environment, passions and hobbies, culture, human rights, conflict resolution, wars, history, religion and community, housing and infrastructure, technology, etc. The impact is clearly seen in student write-ups in the Clap Passports. Every time children meet a traveller, they learn something. Many children have noted in their journals that they became more confident and realized that they could ask questions. The question ball or Q-ball is a good tool to help children ask relevant questions. Children learn to communicate and express themselves. One child noted, “I got confidence to talk to stranger.” Another shared that, “I was surprised that a traveller came to visit us; all the way from China.” Another child wrote that he learnt that Bangladesh and India were very similar and that garbage disposal was a common issue. Through their stories, pictures, games, show and tell items, songs, dance, art and sometimes even just their presence, the travellers help create dreams, aspirations and a big sense of achievement. Every child takes away something different from a Clap Talk. One child shared, “My dream now is to go to France.” “I can now use a chopstick”, “I know how to say hello and thank you in Chinese”, proudly proclaimed another child. When a visitor from Poland gave a Clap Talk, the children gained more understanding about the country. A young girl wrote, “There was a woman as a king. It is very cold in Poland. World War II took place in Poland too. I was astonished to hear this.” “I realized that Afghanistan is a beautiful place and has a population of 24 million people. I loved watching the traditional dance of Afghanistan”, shared another girl after attending the Clap Talk of an Afghani traveller. Clap Talks have a deep impact on some. “I have started to see life from a different perspective. You have given me hope that we can find solutions to my country’s problems,” noted a boy from Mumbai. “I have never really valued India much, thinking of moving abroad, so it’s hard to believe that this one talk has changed my mind-set. This talk has been inspiring, eye-opening and most importantly taught me to introspect and be proud of my culture,” thus stated a young girl. An 11 year old was so moved by the problem of family separation shared by a Korean traveller that he wrote that when he grew up, he would do something so that the traveller could reach her family. Travellers come with an eagerness to share their stories and talk about their country. Their intention is to have more meaningful experiences and make deep connections. “Mexico isn’t just about drug lords and the mafia. That’s what you hear in the news. I wanted to give the students another picture – what it feels like to be a regular person living there,” said a traveller from Mexico after her Clap Talk at a school in Thane. Travellers understand the power of communication and how it can make us open-minded and more accepting. “I was reminded of the power of dialogue and how quickly it can bridge two worlds,” shared a traveller from USA. “We’re coming to a time on this planet where things are really hitting the fan. We need the younger generations to be in tune with global events from an early age,” stated another. In her TED talk, Shirin recounts the experience of a South African traveller. This traveller asked the children, “Who discovered India?” ‘Vasco-da-Gama’ was the prompt reply. “Why do we need anyone to discover us? Weren’t Indians already living here?” Thus she questioned the very notion of this Portuguese sailor discovering India; taught to children for years and years together. She planted the seed to rethink and question what is being taught at school. The impact of bringing travellers to classrooms cannot be quantified and at times cannot be described. It has to be felt says Aarti. It makes us question our belief system, our biases and stereotypes. It makes us rethink our ideas and notions and become more accepting and open-minded. Shirin foresees Clap Global as a fully automated platform integrated beautifully into global education and travel systems. Eventually, representatives from schools will independently scan traveller profiles and select the travellers for a Clap Talk in their school states Aarti. Currently, they are working toward launching Virtual Clap Talks, using Skype as a platform and Anytime Clap Talks – pre-recorded Clap Talks. Virtual Clap Talks will be accessible through the comforts of home or any place with an Internet connection. Anytime Clap Talks can be accessed anytime. These products will reach a wider community and thereby increase the impact manifold. This is the shared vision of school friends Aarti Chhabria and Shirin Johari, co-founders of Clap Global, an organization that enables travellers and children to connect in local classrooms for meaningful conversations. Aarti has always believed in a certain power of firsthand experiences. When she was six-years-old, she met a stranger on a train called Irene during one of her father’s international business trips to Switzerland. After just five minutes of meeting, Irene had invited Aarti’s family to her home for dinner, and just like that, all perceptions that Aarti had imbibed as a child about “strangers” had completely changed. Years later, it’s an encounter that still impacts her decision-making. An inspired educationist and a serial entrepreneur (she’s founded three companies in the space of education in India), Aarti is a socially driven business woman with a classical dancer’s soul. Her main interest and passion has always been education that is egalitarian, accessible and non-complex, so when she was approached by Shirin with the concept of Travellers In Classrooms as an automated platform, Aarti was immediately on board. From the start she has viewed Clap Global as a completely sustainable and scalable business venture and her aim is for it to impact the lives of 1,000,000+ children globally. “I have always envisioned creating something that enables children to learn and grow through an adaptive education system, full of customized human experiences. When Irene had invited my family, strangers, back to her home, she broke so many barriers. I felt for myself how easy it could happen, how all it takes to let someone into your life is making the first move. Something as simple as sharing a thought or an experience,” she says. It was during her early 20s that Shirin began meeting people from different parts of the world through both work in her home city, Mumbai, and personal travel abroad. It struck her to realize that she had inherited all of her values and sense of right and wrong from society, the media, her country’s values, and her family. In other words, everywhere but her own self and her own experiences. Meeting these people involved a lot of busting of stereotypes for Shirin, a lot of “unconditioning” as she calls it. She began questioning why people have to wait until they grow up to be able to have those realizations. Why couldn’t people have these realizations as children? Coming from an innovation and creative background, serving as a creative director with international network agencies like Ogilvy & Mather, JWT, DDB and TBWA for global brands, Shirin began work on designing this idea of connecting the geographically overlapping worlds of travellers and children in local school classrooms. Incorporating some of the skillset her 13 years of experience in the field of advertising and social impact had enabled her to craft, including innovation in brand building, multi-disciplinary design and mixed-media communication, her idea began to take shape. Shirin envisioned ‘Travellers In Classrooms’ as something playing out at a global scale, harmonizing with education and tourism systems across the world. “I shared my design with Aarti. I went to her and said, ‘Hey, I have this idea and I need some business advice. She took one look and she loved it. It was a perfect fit from the start. It was the same vision that we both had and it just so happened that our skillsets were complimentary,” says Shirin. The author, a mother of three, has been involved in the field of education and development for the past 18 years. She facilitates learning in an open school in Pune, is actively involved in writing, teacher training and parenting workshops and has recently joined the unschooling movement. She can be reached at sharmilagovande@gmail.com.